Here are some of the catalogs, sales flyers, advertisements and other Supreme related publications I have in my collection. 1929 In store Supreme Radio Service Counter-top Sign 13¼"x10½"
This Supreme League 6 page brochure describes the advantages for radio servicemen of membership in the Supreme League and offers Supreme cuts and ad slicks for direct advertising. 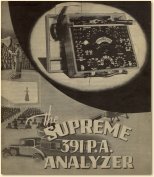 This Supreme brochure contains 1931 entry rules for winning a free Supreme AAA-1 Diagnometer. and the Model 222 Multometer. In 1935 Supreme announced the use of the new "d'Arsonval" fan-shaped meter (seen at right) with "a more consistant and lasting accuracy" and provides "a more scientific and professional appearance". 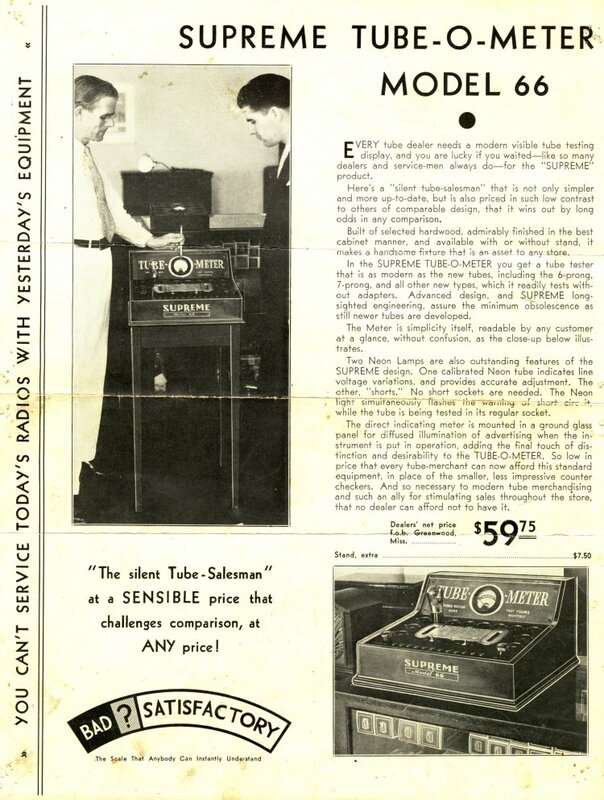 1935 catalog contains descriptions and several full page photos of Supreme testers available in 1935. 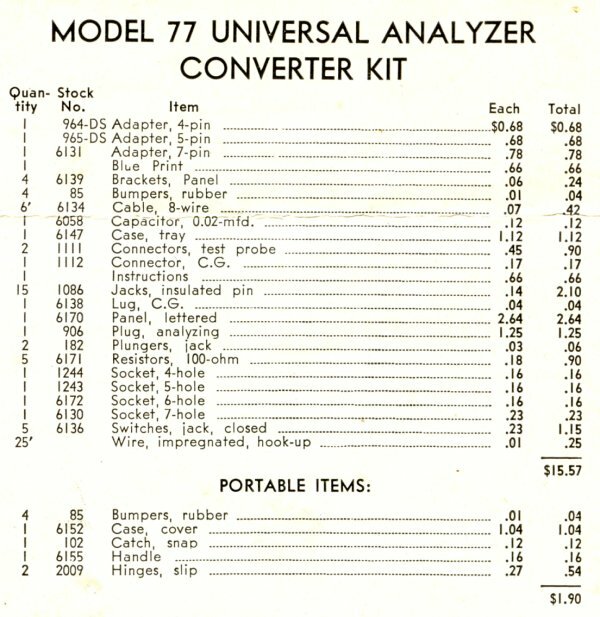 Some of the models include the 85 series tube testers, the 91 Analyzer, the Supreme Standard Diagnometer, the Model 35 Tube Tester, the Model 61 Oscillator and Model 180 Signal Generator, and more. 1936 catalog contains descriptions and several full page photos of Supreme testers available in 1936. Some of the models include the 89 series tube testers, the 385 and 339 analyzers, the supreme 189 signal generator, and the model 391 P.A. Analyzer. Side Note: I find it interesting that there is no contact information in this catalog, no address or phone, only a telegraph code word. 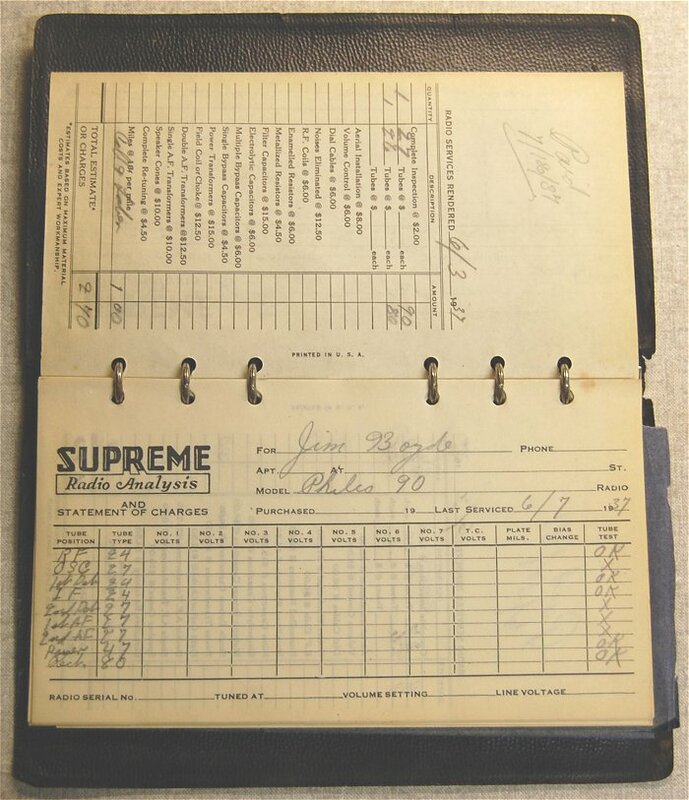 The Supreme 1937 Repair Booklet This is a Supreme Serviceman's repair booklet. Service tickets had many frequently found problems listed along with a checklist for tubes tested. A typical repair was $1.00 plus parts. The 1945 catalog contains descriptions and photos of Supreme Test Equipment and Panel Meters available during 1945. 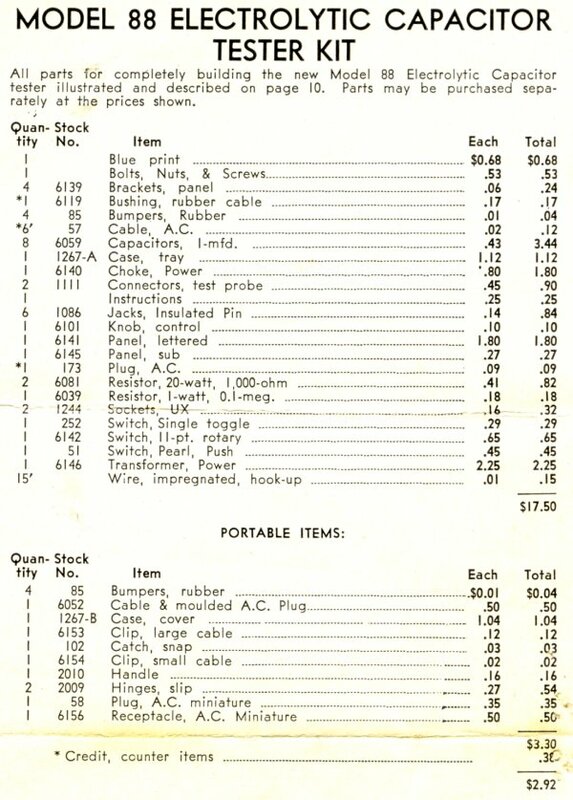 The price list includes instructions for war time purchase approval and expected lead times for delivery. The 1946 catalog contains descriptions and photos of Supreme Test Equipment and Panel Meters available in 1946. 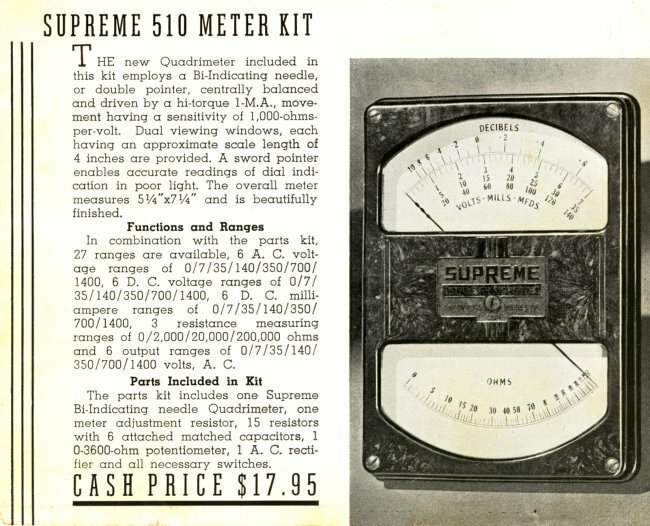 The 1947 catalog contains descriptions and photos of Supreme Test Equipment and Panel Meters available in 1947. 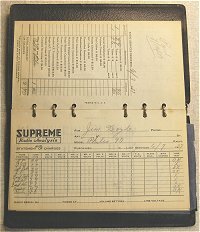 The #848 catalog contains descriptions and photos of Supreme Radio and TV Test Equipment and Panel Meters. This brochure shows the features, options, deminsions and different configurations of the Supreme Test Bench and the Supreme Diagnomoscope Bench. It is not dated but shows labrotory bench configruations using the 500 series Supreme test equipment available around 1938. 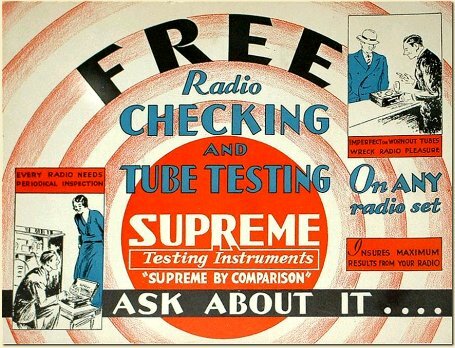 Ad for the Supreme Model 66 "Tube-O-Meter", a modern visible tube testing display for dealers. In the 1930s Supreme published technical flyers to help sell their equipment to the radio repairman. These publications were several pages and gave an in depth look at a particular tester and the advantages of using it for troubleshooting equipment. The flyer pictured at left, describes the advantages of the Model 391 P.A. Analyzer to theatre owners for testing their "Talkie Systems". In 1937 Supreme published this design manual of Tube and Radio Testing Circuits. It is written by Supreme Service Engineer Samuel C. Milbourne. The manual is 60 pages and covers circuit designs used in the 500 series tube testers, the 585 Diagnometer, the 590 multimeter, the 595 P.A. Tester, models 400 and 450 testers, and the 490 multimeter. Note: Due to the file size (60+ pages, over 10 MB) it is not available here for download. If you would like to download a copy, please contact me. 1935 catalog description of system and disk. See more of my cardboard calculators here. Starting in 1947 Perk-Ups was printed bi-monthly for Supreme Representatives and service men. This first issue contains service tips for Supreme equipment, a list of field service contacts, new tube settings, and information on modifying tube checkers. 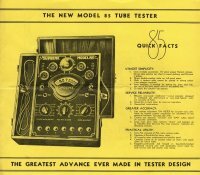 The front cover shows a photo of the new Supreme Model 569 Tube Tester. Printed bi-monthly for Supreme Representatives and service men. This second issue contains service tips for Supreme equipment, tube data updates, quips, and sales suggestions. Supreme re-introduces it's "S.I.C. Easy Terms" payment plan. On the front cover is a photo of what I can only assume is a typical radio repair man of the day in his standard uniform. This third issue contains more tips for radio servicemen, quips, sales suggestions, and a list of Supreme equipment field service stations. 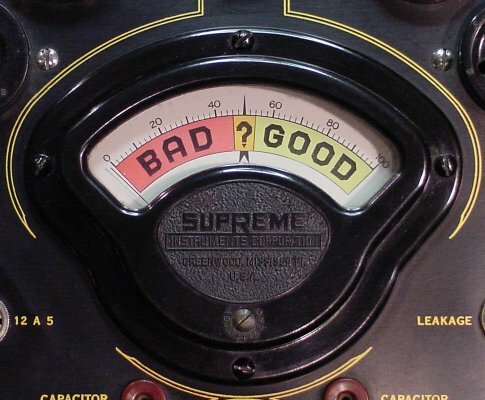 Information on special meters, the 599A tester, company news, additional tube settings for charts 4965-482, and more. Also internal photo of meter movement of the 640 and 644 set testers. Information on new radio and television test equipment, company news and additional tube settings for charts 4965 and 9600. Also several photos including a 1950 Supreme Radio/TV test bench. 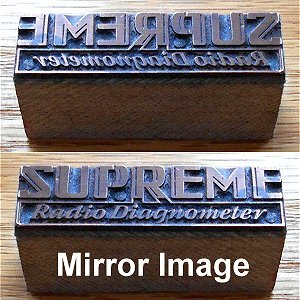 A 1930s Supreme Printer's block for a Radio Diagnometer printed advertisment. I also collect soldering irons and guns. 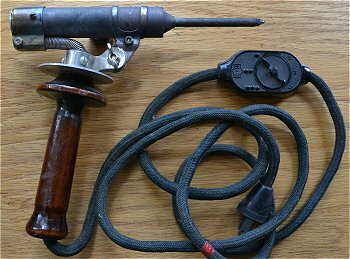 This Supreme Soldering Iron was advertised as the first soldering iron designed specifically for radio repair. In 1937, an article was published in the October issue of Radio News about the new "Suprme Soldering Iron" designed for radio servicing. but it is from the Coca-Cola bottler in Greenwood Mississippi the home of Supreme Instruments and part of my Coca-Cola collection. The data and files contained here are from many vintage sources. There is no guarantee of the accuracy of any information contained on these pages. It is solely up to the end user to decide that the information and files contained here are accurate and fit for use with their equipment. 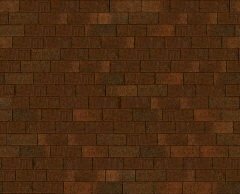 These files are free and may not be resold in any form. I am not responsible for any loss or damages that may be incurred in any way from the use of any information or files contained on or downloaded from this web site.